This recommendation is coming from one of the least organized people you will ever meet…or at least I used to be. If you are hoping for blogging tips to make more money, then it is time you start taking this thing seriously. Carve out time for this dream of yours and stick to it! Snag 2 FREE blog schedule printouts here or check out this amazing Blogging Planner. For me this meant waking up at 6am every day. Trust me, waking up to an alarm clock when I am a stay at home, homeschooling mom is the absolute last thing I want to do. Part of the reason I loved my life so much was the fact that I just woke up when my body naturally wanted to. But the thing is, I have dreams bigger than just sleeping in. So I wake up for them. You should too. No matter what your schedule, find a time in your day where you can dedicate a few hours completely to your blog. The most successful bloggers are waking up early, blogging on their lunch break or during their kid’s nap times and doing everything they can to make sure they are successful. One of the best blogging tips I can give you is to be consistent. If you don’t have a consistent blog schedule, then it is high time you start. Get a blogging planner. The more you post when you are first getting started, the better. My posts go live every Tuesday, Thursday and Sunday at 5am. Setting a schedule for your blog posts is huge because not only do your readers know they can count on you, but it also forces you to hold yourself accountable. Let me take it one step further and say that Google appreciates consistency as well. If you want your little blog to be taken more seriously in Google’s eyes, then you have got to take it more seriously yourself! Checkout this great blogging planner that helps you break your schedule down from months into weeks, keep track of your passwords and plan your SEO perfectly. This is quite possibly the harshest tip I could give you, but hear me out. Of course your family, friends, and Facebook stalkers would love to read a blog all about your daily adventures and what you think about the world around you but the thing is, the rest of the internet has zero clue who you are. Until you have built a strong, solid following, it’s a good idea to steer clear of getting too chatty about yourself. Now, is this always the case? No. Some bloggers have made a huge success out of their life story and it all started with a blog. But more often than not, the people who see success with their blogs are the ones who write for others. People out in the world are searching for answers. They need help with something, they need advice, a recipe or a DIY tutorial. I cringe when I browse Pinterest and see a post that says, “My 5 favorite books this year.” —who are you?! How do I know I will like your books? What genre?! Tell me more. —no one is going to click that link. If you’re still not convinced, think about what you type into Google in a day. Do you type things like, “Great diets for weight loss.” “How to get out of debt.” and “Chicken dinner recipes?” — Chances are you are using these types of searches more than you are looking for a random strangers top 5 favorite books. Now just because I said people don’t care about you, doesn’t mean you can’t use your experiences to help others. Keep this in mind when you are writing your posts. Did you have a really rough experience with your toddler yesterday? Instead of writing out a story that tells people what happened, find a way to make it a teaching point for other moms. Now when you write this post, you absolutely should talk about yourself and your experience!! –People also want to know they are not alone. They’ll enjoy relating to you and are more likely to join your e-mail list or follow you on social media when they know you are relatable and helpful! As you learn these types of things on how to improve your blog, you have got to be willing to roll with the punches. If you love writing posts about how to style an outfit, but no one is reading them…your audience is talking to you. They’re asking for a little change. Does your one post about how you organize a sock drawer do really well? Then listen to that. Maybe organization is where you really shine. If you want more readers, then you have got to be willing to write about what they want to read about. Don’t let your pride stand in your way so much that you think you are the exception to every rule. Because I totally did. When I saw the pins that other people were pinning, I decided I wanted mine to stand out. I would take my own, creative photos and come up with catchy titles….and they never got clicked on. Which brings me to my next point. A lot of people who want to start a blog do so because they have a passion for writing. It’s a natural talent of theirs so they think they will fall head over heels in love with the wide world of blogging. One major blogging tip truth is that running a blog also requires graphic design, technical skills, a marketing mindset and structure. These aren’t all necessarily things creative people possess. Avoid writing in more than 300 word clumps. Break your post down into multiple headings. Change up your font style throughout your post. Avoid script fonts in your pins. Don’t let your photos interfere with the title on your pins. If you are not taking full advantage of every ounce of free blogging information, then you are missing out my friend. Yes, you are going to definitely heard a lot of the same things over and over again. But that should only reassure you that those things are true. Fun Sized Blogging Basics – I have 5 FREE lectures in my course that you can take advantage of. 10 Day Blogging Quick Start – A 10 day course that teaches you step by step how to start a blog. Blogging Bloopers – Learn all my best/worst blogging mistakes so that you can avoid the same fate! Goal Digger Podcast – Every week Jenna Kutcher shares a wealth of information about how to market yourself and grow your business and great blogging tips. I know, I know you’re learning to blog so you can make money but have you ever heard the phrase, “It takes money to make money?” Well, it’s true! Any single successful business owner will tell you this. These are are blogging courses that I have gone through and fully recommend. Affiliate Marketing for bloggers – This is an awesome guide about how to get started and how to be successful with affiliate marketing. Check it out. Blogging Planner – To help you keep every single thing about your blog together and organized, checkout this Blogging Planner by Carly the blogger behind Blogging Like You Mean It. Building a Framework – Building a Framework is the best course for getting a new blog up and running. I purchased Building a Framework early on in my blogging career and it completely changed the way I blogged. Learn more. Food Blogger Pro – Food Blogger Pro has everything you need to creating a thriving food blog. Made by the creators of Pinch of Yum. See the course. Fun Sized Blogging Basics – I took every single question that didn’t get answered for me when I started blogging, and I answered it. Get started with 5 FREE lectures. Making Sense of Affiliate Marketing – Michelle makes over $50K per month with affiliate marketing alone. Learn all of her best tips in her course. Checkout the course! Pinteresting Strategies – Learn the best methods for growing your Pinterest that no other blogger has talked to you about before! This helped grow my traffic huge AND it’s super affordable! See the course. Pitch Perfect Pro – Pitch Perfect is a course I took hosted by successful blogger, Jenny Melrose. She will walk you step by step through how to pitch to brands and what to do once you’ve got them. Start pitching. My personal course creation platform of choice is Teachable. Teachable is a great way to create your own courses so that you have an additional way to make money with your blog. The best part is, Teachable is totally free to get started. The main reason why I would recommend paying for Teachable ($29 per month minimum) is to have the use of affiliates! You are able to create your own affiliates for your courses with this plan. That means people who take your courses can recommend them to other people. When they do this, they will get part of the profits and you will get the rest! Creating your own affiliates of your own is a great way to make more money, reach a wider audience, and do less work! Get started with Teachable. Automation tools are tools that are designed to take some major workload off of you. My personal favorite is Tailwind. Tailwind is a great tool that helps you schedule pins to Pinterest so that you aren’t spending hours each day doing this. I discuss my personal Pinterest strategy in my course, Fun Sized Blogging Basics. You can actually watch me schedule my pins on Tailwind, see how I manually pin and get all the best tips for setting up a quality Pinterest profile. Get 30 FREE days with Tailwind. There are a ton of great, free ways to start your e-mail list when you first start blogging, but there are great reasons why you might consider paying for one as well. When I started blogging, I decided to pay for e-mail marketing with Constant Contact. I paid less in the beginning because I had fewer people on my e-mail list but because of Constant Contact’s helpful sign ups and automation tools, my list quickly grew to 10K which meant I was quickly paying more for their services. Because I pay for e-mail I can do automated e-mails where they send a new e-mail each day when people sign up for a certain e-mail course. I am able to take polls to learn more about what my readers want. I get detailed reports on which e-mails are opened and what links are clicked on and can even send out multiple e-mails to see which one does better. Check out Constant Contact. 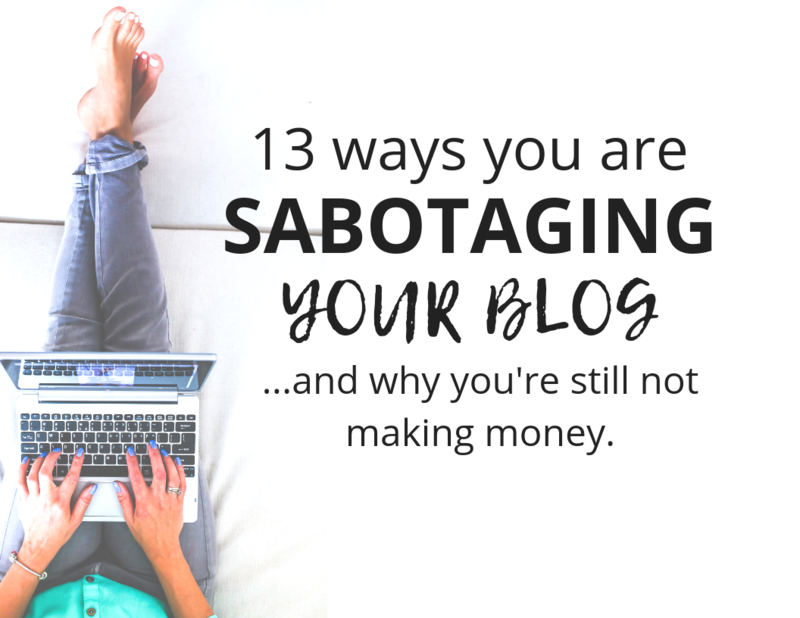 This is a tough one for most bloggers because there are so many things we could easily write about on a daily basis. In the wide world of blogging, you will also run into a lot of people telling you to either “niche down” or telling you it doesn’t matter at all! Here is my basic, super simple blogging tip behind why you should be willing to niche down: You can focus better on one thing. If your blog isn’t gaining traction and you are writing about multiple things, I highly recommend niching down for a while. Instead of writing about food, finances, makeup, DIY and motherhood try choosing one topic. If you choose to focus on only one topic you will be able to perfect this area and learn more about what these types of readers want. After you have mastered one niche, then work on expanding. Learning your audience is crucial to seeing success and it’s hard to learn an audience when you are trying to cater to multiple different ones. A lot of times bloggers get so excited by the idea of monetizing that they throw around affiliate links in a really half-assed way. Excuse my language. Doing this can come across as really inauthentic and might even drive people away. Take the time to focus on high quality content with a few affiliate links. Work to get readers to come back to your site and build trust with them before you start asking for money. So, how do you start making money with affiliate links without sounding spammy? Just like niching down can help you to focus more on one things, so can using less affiliates. Pick 5 affiliates that you strongly support or believe in and focus on naturally and authentically mentioning them in your posts. In my course, there is a free lecture all about how to create affiliate links. If you are unsure of how to, make sure you check that lecture out. Using less affiliates can help you focus in on how to make these few affiliate links work for you, you can narrow in on how to promote them and any consistent readers will start to see how much you really recommend these specific affiliates which will make them more likely to click your link. One of my biggest struggles when using affiliate marketing was using sneaky wording to promote different affiliates. There is an awesome app that saves you tons of money. There is an awesome app called Ibotta that can save you a ton of money when shopping or planning vacations, and you get $10 totally free just for signing up! Sign up with Ibotta. See the difference? The “awesome app” link is not going to get you nearly enough clicks. It may not be as glamorous just getting strait to the point with your affiliate links, but it is exactly what your readers need. This all comes back around to that darn creative side of the brain again. While your creative side is wonderful, this is another area where you might be getting yourself into trouble. I used to write catchy blog titles like, “Every light in the house is on.” It was a great post written about how when you see houses with lights on everywhere it usually means that every family member is s p r e a d out. They are separate from one another. One light, in the center of the house often means dinner time or family game night. –This post was naturally read and adored by my personal Facebook friends, but that’s it. Do not write a post, link an affiliate, or promote a sponsor that you do not actually support! This was a struggle when I first started doing more minimalist focused posts. — “How in the world am I going to make money when I support owning less?” — I can’t link to Amazon purchases, I can’t recommend new, fun toys….what am I going to do? I’ll totally fail. Digit – This app syncs up to your most used bank account and automatically saves you money for a rainy day, PLUS will help you avoid overdrafts! Get signed up! Savings Builder – Get up t a 2.25% interest rate with CIT Bank by depositing only $100 per month into a Savings Builder account! Simplify + Planner – This amazing planner and organizer combo helps you keep track of all your important dates and more. Plus, you can customize it to exactly what you need! See the available options! Trim – This app takes a look at your spending habits and instantly finds different areas where you could be saving money! See where you could be saving. Decluttr– Decluttr is a super easy online way to sell your unused things to get the maximum amount of money! Start selling your stuff with Decluttr. The Paperless Home – The Paperless Home guides you step by step through how to start clearing paper clutter and getting all your most important files stored across your devices so they are easily accessible at your finger tips no matter where you are! See available options! If I haven’t said this enough yet, remember that you content is key! No matter how many bloggers told me this, I just continually didn’t listen. You have got to be giving something back to your readers, or they will not come back. If you keep pushing for sales or writing half-assed posts, people will catch on. Build a solid, strong following through quality content. When the audience comes, the opportunities for making money will follow!